This Halloween, I’ve teamed up with my friends at Borden cheese to bring you the BEST, EASIEST and SILLIEST Pre-Trick or Treat Dinner EVAH. I don’t know about your little people, but the “rush” starts BEFORE we go trick or treating and before they consume any sugar. They can all amped up on excitement, putting on costumes, running up to our neighbors to check out their costumes, and just the anticipation of how full their candy bags will be by the end of the night. Silliness takes OVER and the thought of getting a them fed before trick or treating is….well….just a thought?? No, not really – but the chaos and pandemonium of excitement makes me want to skip dinner all together and just nosh on snickers all night. Because, peanuts are protein. Is that enough? This right here is the PERFECT meal to make right before trick or treating. “GHOULED CHEESE” with some fruit…then out the door they go…. Halloween is the perfect excuse to have a little fun in the kitchen and celebrate the ghouls and goblins! 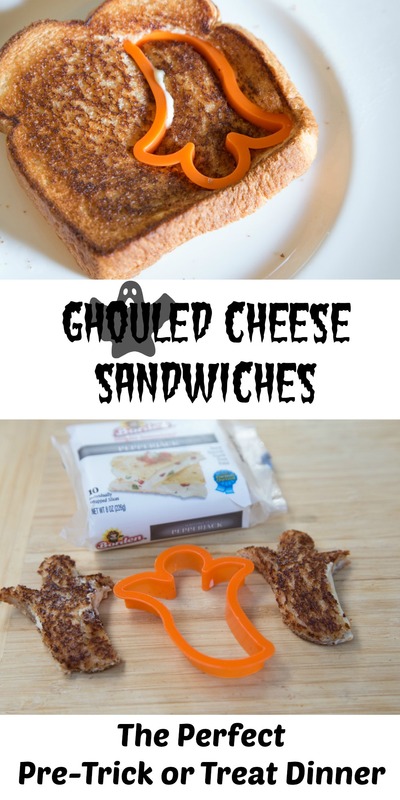 Serve these fun Ghouled Cheese sandwiches for your kids – set up a “grilled cheese bar” with the cookie cutters and let the kids make their own creepy, ghouly sandwiches for dinner! 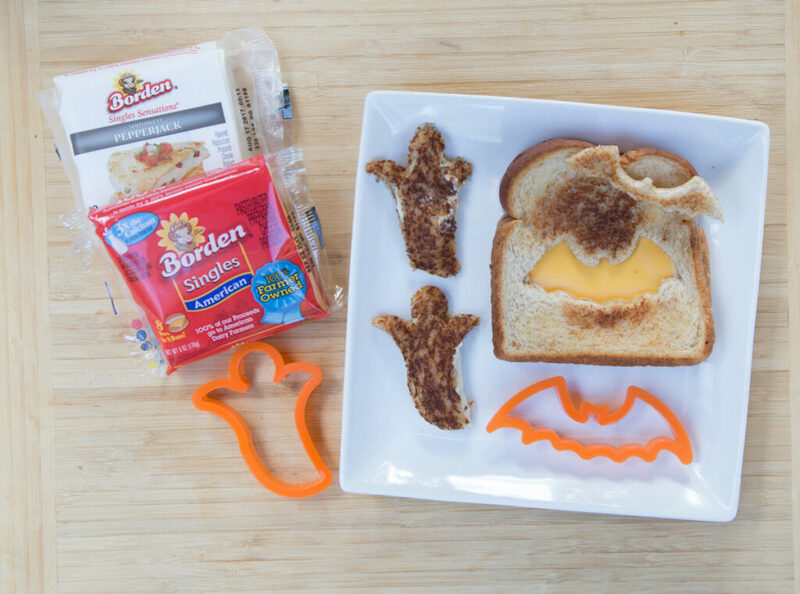 From tombstone taco dip to pumpkin-shaped cheese and crackers, Borden Cheese is the perfect addition to make any Halloween dish frighteningly delicious. For over 150 years, Borden has been producing wholesome dairy. Borden Cheese is produced by Dairy Farmers of America, a cooperative of over 8,000 Dairy Farms across the country. The Borden Cheese mission is to help families enjoy wholesome delicious meals as often as they can. Butter both sides of the sliced bread, add slice of cheese between and grill over medium heat for 2 to 3 minutes per side, until browned to your liking. 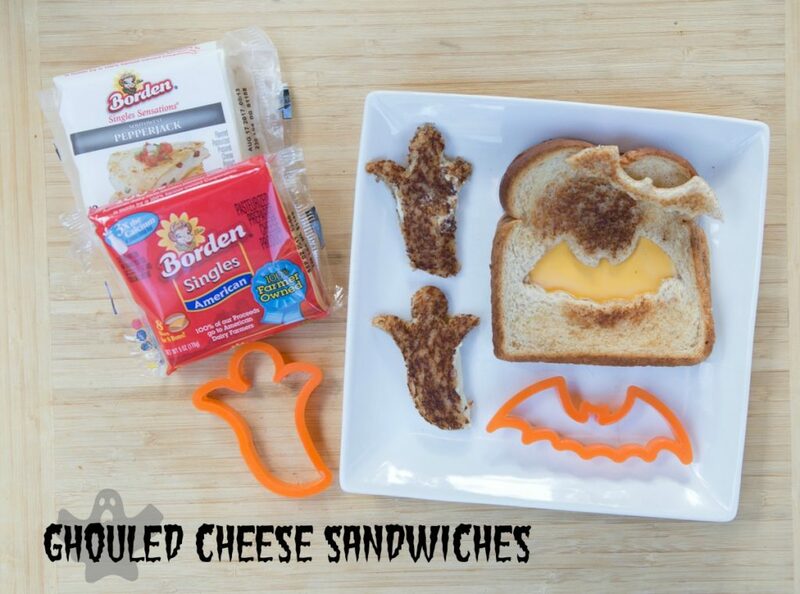 Serve GHOULED CHEESE Sandwiches with fruit. Disclosure: This post and recipe is sponsored by Borden Cheese. Opinions and silly fun are my own.